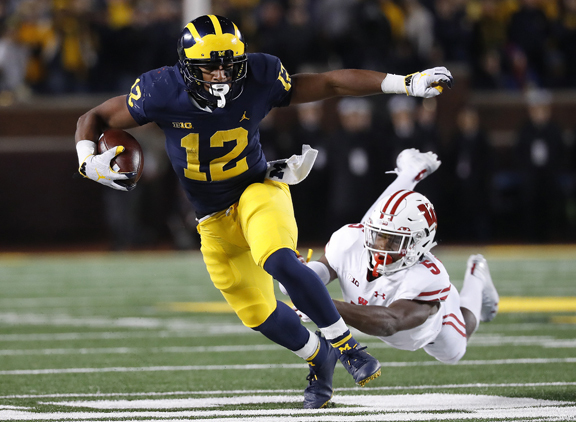 ATLANTA — Michigan probably will need more than one running back to replace Karan Higdon in Saturday’s Peach Bowl against Florida. The leadership void left by Higdon’s exit may be even more difficult to fill. “Karan was our guy, our offensive leader, and we all kind of followed him,” quarterback Shea Patterson said Thursday of Higdon, the team’s leading rusher and offensive captain. Higdon is one of No. 8 Michigan’s four draft-eligible players who chose to skip the Peach Bowl to begin preparations for the NFL draft. No players for No. 10 Florida have said they are bypassing the bowl game. Michigan senior right tackle Juwann Bushell-Beatty and two juniors, defensive end Rashan Gary and linebacker Devin Bush, also are missing the game. The good news for the Wolverines last week was Patterson’s confirmation that he’ll be back in 2019 for his senior season. Patterson, the Mississippi transfer, said he wants to enjoy another season at Michigan. “I definitely just got a taste of it this year with my teammates and my coaches, and I couldn’t have been more happy to come back for one more,” he said. The NFL decisions by the four Michigan players made the bowl game a 2019 audition for their replacements. Depth chart adjustments were necessary for Michigan (10-2).